Many health networks, both new and established, rely on the services of outside consultants to obtain assistance and guidance. The National Cooperative of Health Networks Association (NCHN) Network Member Executives and Associate Members have an invaluable wealth of network knowledge and expertise. For years, NCHN members have provided their knowledge and assistance informally. Formalizing this process will help connect network leaders to specialists who have the knowledge needed to further their goals, while also facilitating a platform through which networks can be compensated for support that is often too extensive for an informal context. Rural Health Network Resources, LLC (RHNR), wholly owned by NCHN, has developed a Consulting Group to provide referral services for health networks. RHNR is developing a database of consultants and specializations that can be utilized to connect networks seeking services to consultants with the requisite expertise. The consultant application is now available online. Current NCHN organizational members and NCHN Associate Members are invited to apply to be a member of the RHNR Consulting Group Team. A link to the application was sent out via email to NCHN members. If you have questions or need assistance, email Christy or call 540-352-2529. On Monday, September 10th, NCHN held a Quarterly Membership Call which covered Meaningful Use Stage 2 and Legislative Updates from NRHA. Related documents were posted under Documents > Membership Calls. These include Meaningful Use Stage 2 and 2013 Edition CEHRT Standards and Criteria (Aaron Fischbach, HRSA), Legislative Update from NRHA, and the call transcript. If you missed the call, this is a great way to catch up on the information you missed. NCHN members can register for the calls at no cost (a savings of $79/ea.). 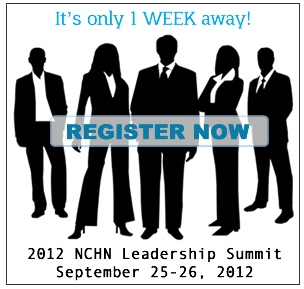 The link to the registration form was sent to NCHN Members on Monday, 9/10. If you did not receive the email or need assistance, email Christy. September 11, 2012 (Indiana University Health) - The IU Health Starke Hospital Community Board named David Hyatt President of the health facility in Knox at its regular meeting Monday evening, September 10th. Mr. Hyatt joined IU Health La Porte hospital as a Business Development Associate in 2007. He transferred to IU Health Starke Hospital in September of 2009 as Vice President of Operations. In 2010 he added the title of Vice President of Strategy and Ambulatory Services for IU Health La Porte Hospital. In June of 2012, Hyatt became Interim President at Starke. Community Board President Ben Bennett said the board was very impressed with Mr. Hyatt’s enthusiasm, and stated plans for the future of the hospital. “David worked closely with former President Linda Satkoski, and is now ready to move us forward in the years to come,” said Bennett. Raised in Columbus, Indiana, Mr. Hyatt holds a Bachelor of Science Degree in Public Health and Masters in Health Administration from Indiana University. He serves on several boards including the Starke County Economic Development Foundation, the Starke County Chamber of Commerce, Catherine Kasper Life Center, and Growing Rural, a youth development organization. September 14, 2012 (Rural Health Voices) - The National Rural Health Association’s Journal of Rural Health is making national news today, thanks to a research article on rural obesity. Forty percent of rural residents are obese, compared with 33 percent of adults living in urban areas. "Overview of the Meaningful Use Stage 2 Final Rule for Safety Net Providers"
The Accountable Care Organization (ACO) movement is changing our world and it's changing fast. To help the Healthcare in the Know community better understand ACOs, we are honored to have Rhonda Anderson, RN, DNSc, FAAN, FACHE join us for a complimentary webinar and discussion on Tuesday, September 18 at 11:00 PT/ 2:00 ET. During this special event you will get an insider's view into the inner workings of ACOs. You will gain insights into the experience of Banner Health over the last three years as they redesigned care to work within the "new world order". Dr. Anderson will also share with us movement on the national level and discuss implications for the frontline of care delivery. Join us to see a comprehensive overview of the rural healthcare system demonstrating rural versus urban cost effectiveness, effeciency, patient perception and quality. The information in this important study is being used across the country to advance advocacy efforts to defend the very existence of the rural health safety network which is currently under siege. Establishing your practice or practices within your health system as a certified Patient Centered Medical Home (PCMH) model of care demonstrates your shift from volume to value. But what does PCMH actually mean? How do you prepare your patients and practice(s) for implementation of a PCMH approach to care delivery? And how do you get paid for your efforts? September 14, 2012 (Kaiser Health News) - Medicare providers would see reductions of about $11 billion beginning in January as part of series of automatic spending cuts set to begin next year unless Congress acts to halt them, according to estimates released Friday by the White House Office of Management and Budget. September 11, 2012 (Becker's Hospital Review) - To meet goals of improved quality and reduced costs in today's changing healthcare environment, hospitals are being forced to be creative and flexible in their strategies. As part of the transformation to value-based care, many hospitals are beginning to focus strategies on population health management, one of the core goals of healthcare reform. Managing population health will require close relationships with physicians, partnerships with organizations in the community and expansion into preventative and outpatient care. Here are six key strategies forward-thinking hospitals and health systems are using to achieve population health management and other quality and cost goals. September 5, 2012 (Becker's Hospital Review) - Lean process improvement is becoming a popular method for hospitals looking to streamline processes, reduce costs and improve quality. While the general principles of Lean management are increasing value and eliminating waste, Lean has five performance measures hospitals should be aware of to best leverage this strategy. Marc Hafer, CEO of Lean transformation company Simpler Consulting, explains the five key performance dimensions of Lean. September 12, 2012 (Katya's Non-Profit Marketing Blog) - Today I call your attention to a fantastic presentation by Google via SocialFish. It shows how consumers seamlessly shift among devices throughout the day - which is critical for those of us in nonprofit marketing and fundraising to understand. It is well worth your time and attention, so I’m including it in this post. September 14, 2012 (RAConline.org > Online Library > News) - Agriculture Secretary Tom Vilsack today announced funding for rural water projects to create jobs and improve rural water and wastewater systems in 16 states. "These improvements to rural water infrastructure will provide reliable access to clean water, improving public health while creating jobs that strengthen rural economies." Vilsack said. "The Obama Administration is working to support creation of a vibrant, sustainable rural America and clean water is a basic necessity for the health and economic growth of our rural communities." September 13, 2012 (HHS News Release) - Local public health officials can use a free new Web-based application, MappyHealth Exit disclaimer icon, to track health concerns in real time in their communities using Twitter, the U.S. Department of Health and Human Services’ Office of the Assistant Secretary for Preparedness and Response (ASPR) announced today. MappyHealth is the winning submission of 33 applicants in a developers’ challenge, “Now Trending: #Health in My Community,” sponsored by ASPR. Health officials can use data they gain through the app to complement other health surveillance systems in identifying emerging health issues and as an early warning of possible public health emergencies in a community. September 12, 2012 (South Carolina Rural Health Research Center) - Our chartbook adds to existing knowledge regarding conditions in the border region by examining potential geographic and ethnic disparities among U.S. border residents. Our chartbook describes select indicators related to access to care, women's preventive services, oral health, infectious and communicable diseases and mental health that have been previously identified as serious disparities warranting programmatic and policy interventions. We examine these issues among residents of the four border states, Arizona, California, New Mexico, and Texas, comparing indicators by ethnicity (Hispanic vs. non-Hispanic), rurality (rural vs. urban), and proximity to border (border vs. non-border). Our findings should be useful in educating public health officials, policymakers and intervening organizations such as the United States Border Health Commission, the Office of Rural Health Policy, and the National Rural Health Association. September 12, 2012 (HHS News Release) - Department of Health and Human Services (HHS) Secretary Kathleen Sebelius and Secretary of Veterans Affairs (VA) Eric K. Shinseki today announced a joint effort to expand health care delivery to veterans living in rural areas. The agreement between the two agencies promotes collaboration between VA facilities and private hospitals and clinics, and is supported by $983,100 in grants to improve access and coordination of care through telehealth and health information exchanges in rural areas. September 12, 2012 (HealthIT Buzz) - Recognizing the need to strike a balance between the urgency of modernizing our health care system and the pace of change that can be absorbed by providers and health IT vendors, CMS and ONC have implemented the Medicare and Medicaid Electronic Health Record (EHR) Incentive Programs in three stages, with each stage adding increased functionality and advanced concepts designed to improve patient care, enhance care coordination, and increase patient and family engagement. Released in July 2010, the final rules for Stage 1 focus on functionalities that support the electronic capture of data and allow patients to receive electronic copies of their own health record. It’s important that providers take the steps now to register for the EHR Incentive Program on the CMS website. October 3, 2012, is the last day for eligible professionals who want to collect the maximum Medicare EHR incentive payment to begin their 90-day reporting period in 2012. Eligible professionals who wait until next year can still participate but will receive reduced incentives. September 14, 2012 (HealthReform GPS) - The Affordable Care Act (ACA) establishes Affordable Insurance Exchanges, which are entities that facilitate the purchase of Qualified Health Plans (QHP) and provide for the establishment of the Small Business Health Options Program (SHOP). Previous GPS Implementation Briefs have covered these topics here and here. On May 16, 2012, the U.S. Department of Health and Human Services (HHS) issued a Draft Blueprint for Approval of Affordable State-based and State Partnership Insurance Exchanges, which provided additional implementation information related to the final Exchange regulations issued by HHS in March 2012. On August 14, 2012, the Office of Consumer Information and Insurance Oversight, a division within the HHS Centers for Medicare & Medicaid Services (CMS), released the final version of the Exchange approval Blueprint. The Blueprint process is designed to assure that Exchanges are approved for operation by January 1, 2013 so that they can begin offering coverage through QHPs on January 1, 2014. September 12, 2012 (HealthLeaders Media) - Nearly half of Tennesseans living in rural areas who seek healthcare drive past the hospitals closest to their homes to look for care in more urban settings, even when their local hospitals offer the same services, a study shows. We seek to improve community health by encouraging cross-sector collaboration and the integration of community-health strategies into health care, especially the primary-care safety-net. Unemployment, loss of insurance coverage and increases in chronic disease and mortality have converged with government spending cuts and shortages of primary-care physicians and clinics to produce wide gaps in access to and quality of health care among all groups in the United States. For low-income, minority communities this situation is particularly acute: evidence shows that this population has historically received a substandard quality of care and is exposed to conditions that have adverse effects on health. We believe that improving the nation’s health, especially for vulnerable populations, requires more than increased health care. It requires a focus on the social determinants of health, things like air quality and access to healthy food. Factors as varied as crime and the absence of parks may contribute to injuries and illness in different communities. Health care providers and systems are beginning to recognize the need to address the underlying social and physical conditions that affect the health of their patients. At the same time, there is increased demand on community health centers and the primary-care safety-net.